Leading commercial silk Alan Galbraith continues his role at the Bar as a legal leader with a heavy workload. Another Rhodes Scholar (1967) like Power Lister David Goddard, and an Oxford graduate, his academic and personal credentials stand him in good stead, providing testimony to his intellect and legal ability. Another Rhodes Scholar (1967) like Power Lister David Goddard, and an Oxford graduate, his academic and professional credentials have helped place him at the forefront of the commercial bar. Based in Shortland Chambers, Alan Galbraith continues to appear in courts nationally, a high profile recent case being his representation of Queenstown major and businessman Jim Bolt, facing charges over the collapse of Stonewood Homes. A Queens’ Counsel since 1987 he is also a passionate runner like a number of the other Power List members (Fisher QC, No. 13) and has slipped in rankings with the elevation of other members of the list, rather than through any reduction in workload or influence. He continues to make news with major cases, including his recent representation of the ANZ Bank which sued the FMA in a case sensitive enough to have it removed from the High Court list. The case follows the 2014 settlement agreement that ended the FMA’s investigation into the selling of interest rate swaps, which saw the bank deny breaches of the law or that it would fail in the civil or criminal proceedings against it in respect of the controversial swaps. Being slight of build and as quick footed physically as mentally, his other abiding interest is horse racing which has seen his “Rich Hill Stud” interests in the Waikato, shared with former Supreme Court Justice Bill Wilson QC. Among his notable cases have crossed the spectrum of New Zealand business, ranging from litigation where he has appeared for Air New Zealand, the Auckland City Council, the BNZ, Brierley Investments, Fisher & Paykel, Fletcher Challenge, Fonterra and just about every other significant name in New Zealand commerce. He has also served as a board member of the TAB, the NZ Racing Industry Board, NZ Racing Authority, Broadcasting Commission and most recently as Deputy Chairman of the Sports Tribunal and his most recent high profile case was representing former NZX CEO Mark Weldon in the lengthy lawsuit between the Exchange and Melbourne-based Clear Grain Exchange. 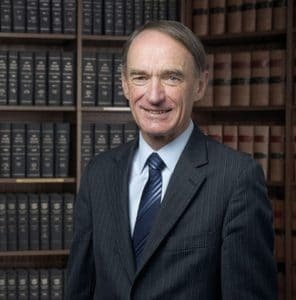 The row over his business and personal connections with former Supreme Court Judge Bill Wilson QC may have created personal angst, but hardly slowed a busy workload for the diminutive QC.